This guest post comes to us via Jon Fellowes of Last Minute Musicians. Becoming a professional guitar player can take a lot of time and effort, but learning from the best is sure to help you set yourself up for success down the line. By the way, if you think you might have something to share with the community, you might consider writing a guest post too. With that, here’s Jon to fill us in on how to become a professional guitar player. 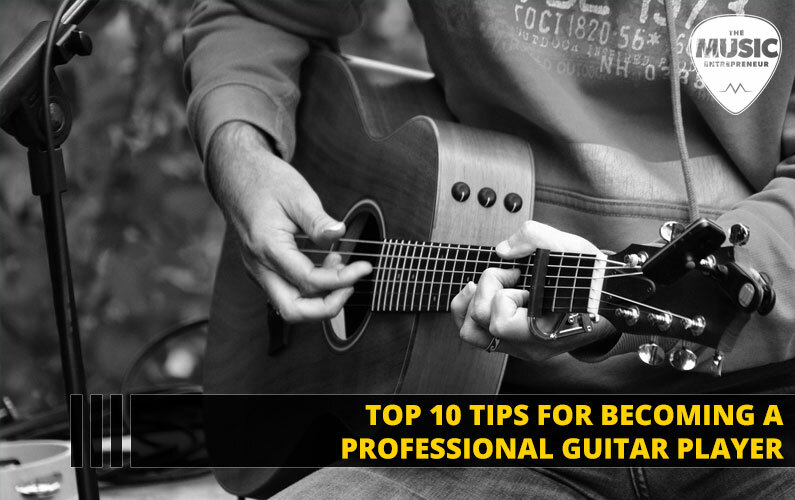 For those looking to make the jump from student or semi-pro to full-time professional guitar player, there are several things to consider. While the financial challenges are obvious, there are many day-to-day things that can help prepare you for the lifestyle of a professional musician, some practical, others more ideological. While everyone will have different goals, In this post we’ll explore everything from how to start making money to staying motivated. Whether you are looking to tour with established artists or slog it out in the local pubs, it’s important to have the right tools for the job. For instance, a session guitar player could get called in to work in any number of different styles, so having both single coil and humbucking guitar pick up options is essential. Consider your effects pedal board – while it might be tempting to go out and buy only the things you like, the reality is that you may need to emulate others, especially on function gigs. Having access to a high quality acoustic guitar will also open up a whole range of possibilities, from solo acoustic performances in restaurants, to popular YouTube acoustic videos and “live lounge” style sessions. Pro tip: Get all of your instruments professionally set up by a local luthier, to ensure they are easy to play and properly intonated. When it comes to amplifiers, there are so many factors to consider, but an important thing to think about is reliability. Regular servicing will help, but if you are planning to do lots of touring or regular gigging, investing in a good flight case or other protection would be best. When it comes to insuring your gear, there are many private companies that offer instrument insurance – some as an extension of your home insurance. It’s worth thinking about joining the Musicians’ Union, who provide up to £2000 worth of coverage with membership. If you’re in the US or Canada, check out the American Federation of Musicians. When looking for a stable income stream, a great place to start for aspiring musicians is to join a function band that plays weddings, corporate events and birthdays. With the proper promotion, these bands can be out every weekend, earning good money. The transactional nature of their business (predominantly fee-based, as opposed to ticket splits) makes it easier to negotiate a reasonable wage. Pro tip: Joining an entertainment agency or entertainment directory (Like Last Minute Musicians) can be a great way to kick-start any new wedding or function band, and start getting some enquiries coming through. The more gigs you play, the more you realize how many potential problems can arise. Professional shows aren’t always local and will almost always be high pressure. 9 Volt batteries/backup power supply. Another great source of cash is teaching your instrument. A lot of people tend to have a very old fashioned idea of what guitar teachers should be, but cheesy adverts in the paper and teaching out of a spare bedroom are no longer the whole equation. Community spaces now double as teaching rooms, independent charity-ran music schools sometimes have hundreds of pupils and it’s now possible to use Skype or Google Hangouts to teach students, not just in your local area, but all over the world. Traditional word-of-mouth advertising is always a good option, but posting on social media and in various groups like UK Music Teachers can help get you your first students. There are plenty of other groups on Facebook depending on your locality. Do a search and see what you can find. Networking is just a fancy term for making friends. When starting out on your music career, it’s important to get to know your local music scene. Get out to gigs, open mic nights and other events. While there, you will get to know the venue owners, individual players and bands that could form the basis of your next career move. You never know who you are going to meet and what effect they could have on your career as a musician, so be nice to everybody! It’s important to be as available as possible for gigs and sessions but, on occasion, illness or other sudden events can make cancelling unavoidable. In a situation like that, it’s handy to have a list of stand-ins or “Deps”. These should be reliable players (preferably people you have worked with in the past!) who can fill in for you at a moment’s notice. You can also make a little extra money from gaining a reputation as a reliable Dep for other people. Pro tip: Keeping up to date with the types of material function bands in your area are playing can help minimize the stress of learning a big set at the last minute. Word-of-mouth is all well and good, but it’s also important to stay active on social media. Not only will this help you secure bookings for your various projects, but it will also let fellow professionals know the types of work that you are securing and have experience in. If people are aware that you play acoustic shows at weddings for example, the more likely they are to pass any enquiries they have along to you. Like most things in life, you can never completely master the guitar. While for some this can seem frustrating, in reality it is a never-ending opportunity to learn new styles and become more familiar with your instrument. Work on your weaknesses and develop a new appreciation for other styles of music. The more diverse you are as a player, the more styles you will feel comfortable performing, be that live or in the studio. As a professional musician, you will almost certainly be self-employed. This means that certain legitimate expenses involved in your career can be set against your tax bill, like new equipment or mileage to and from gigs. It is, however, important to be able to justify any of these expenses, so keep the receipts of any new gear purchased and be prepared to defend any purchase you want to write off. Pro tip: You can learn more about registering as self-employed on the GOV. UK website. In the US, you can go to USA.gov to learn more. The fact that you are reading posts like this is great – it shows initiative. No matter how hard things get, it is important to remember why you got started in music in the first place and stoke the fire of your passion. Keep one eye on the future and plan out the course of your next idea or project. Stagnation can prove a tough thing to overcome sometimes, but with the right inspiration and determination, you’ll be amazed at how many of your goals will prove within reach. Above all, keep a great attitude and be easy to work with. Those who prioritize human connection over skill and experience tend to get more and better gigs. Jon Fellowes is head of Content Creation and Press Liaison at the entertainment directory service, Last Minute Musicians. He is also a freelance session guitarist and bass player, recording and touring all over the UK and Internationally.